At events, visitors have admired a much-prized 'in the round' carving of the Prince of Wales feathers, so Clive Griffin decided to carve them on a spoon and this design, too, has proved to be popular. The feathers have been carved to look as if they go through the banner. This is achieved by maintaining the top of the banner as a high point. It should look as if it 'rests' on the feathers. Each inside section of the banner tapers in towards the feathers and then moves outwards to the edge of the spoon. For realism, the pieces that taper outwards to the edge of the spoon need to be carved to a lower point than the rest to give an impression of a single fluid movement. Carve or burn the person's name - or regiment, if applicable - into the banner. For a cushioned effect, the heart is nestled between the supporting chip-carved arms with rounded edges. For added decoration, chip-carve the outer edge of the arms using a knife or a No. 8, 9 or 11 chisel. 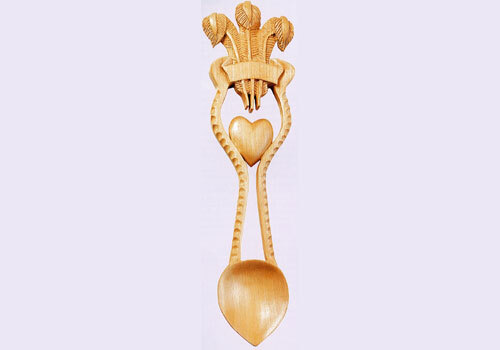 The spoon has been carved in lime which allows a lot of detail without the figure or grain detracting from it. The Prince of Wales feathers on this spoon have been carved as if they were in the round. Because ostrich feathers are long and heavy at the tip, they bend with the weight. We have left this area as a high point so that all sides can be rounded to create a curve. Each middle section has been reduced in scale so that the curved area stands proud of each main shaft. As you carve this part, keep in mind that each quill needs to be slightly higher than the area to each side. Take note that the two outer feathers have been arranged to slope away from the central one. The internal area between the banner and the heart, and between the bottom of the heart and the top of the bowl, has been removed using a scroll saw.